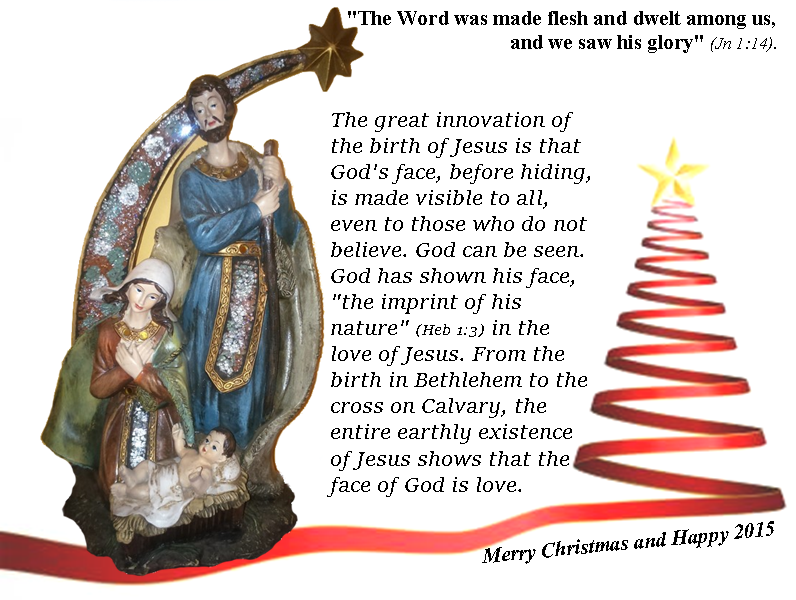 The great innovation of the birth of Jesus is that God's face, before hiding, is made visible to all, even to those who do not believe. God can be seen. God has shown his face, "the imprint of his nature" (Heb 1:3) in the love of Jesus. From the birth in Bethlehem to the cross on Calvary, the entire earthly existence of Jesus shows that the face of God is love. 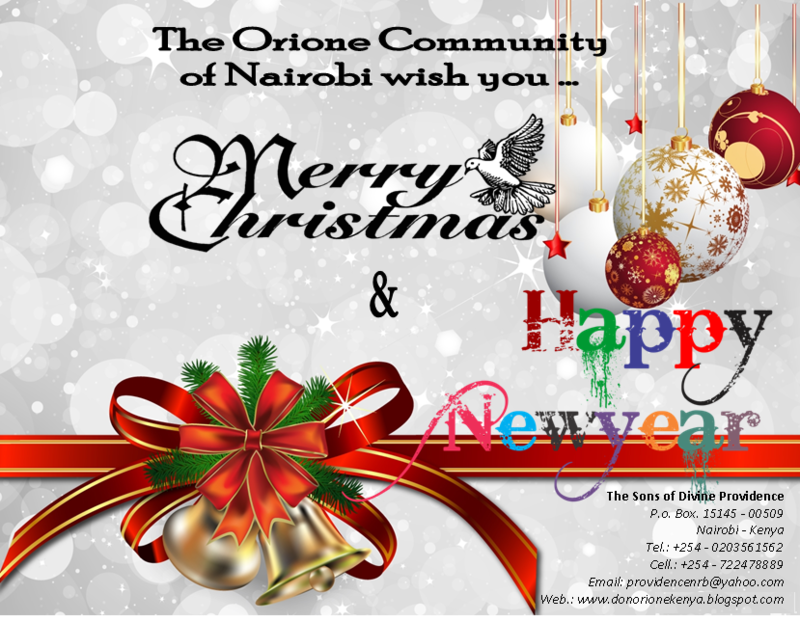 The Communities of the Sons of Divine Providence of Nairobi, Kandisi and Kaburugi wish you a Merry Christmas. May this season bring you joy and laughter. Anthony, Andrew and Simplice, deacons through the hands of Mgr. Giovanni D'Ercole. 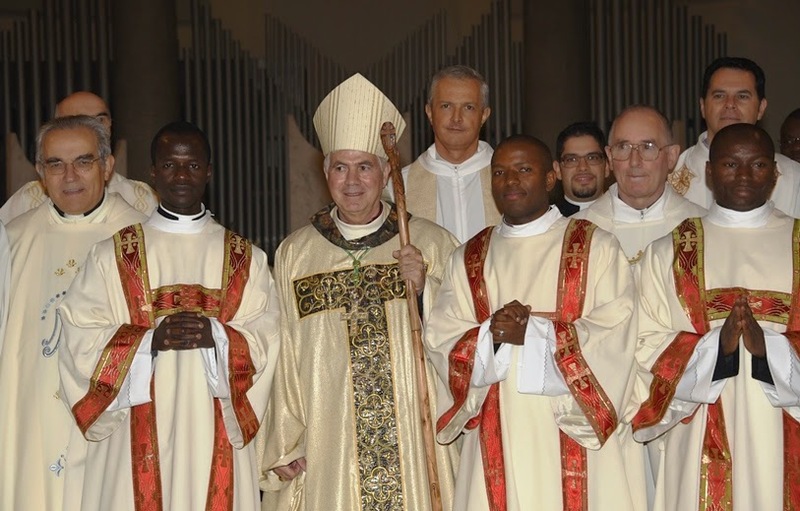 In a joyful surround of Brothers and faithful, in the parish church of All Saints (Ognissanti), in Rome, on December 8, have been ordained deacons three Orionines Clerics Andrew Langbong Koungbanwo (Togo), SIMPLICE Hitoka Teta (Togo), both from the Vice-Province Our Lady of Africa, and ANTHONY Njienga Mburu (Kenya) of the Missionary Delegation Our Lady of the Church. The ordaining Bishop was Mgr. Giovanni D'Ercole, Orionine Bishop of Ascoli Piceno. In his homily Mgr. D'Ercole proposed Mary as a model of diakonia (service), she who was entirely and exclusively for God, and was all directed to the good of men of whom she is constituted mother. 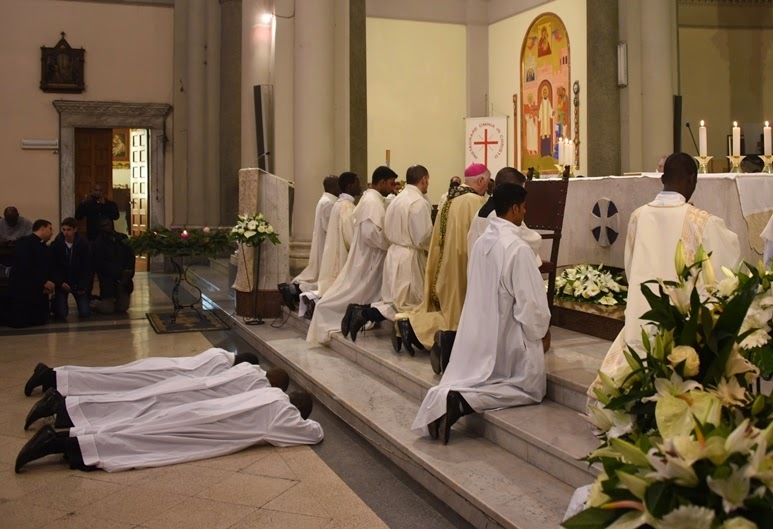 The ceremony was attended by many confreres, superiors and seminarians of the Orionine Theologicum and many other colleagues of studies of our three new ordained deacons. Fr. Malcolm Dyer, Superior of the English speaking Delegation, addressed some words of thanks by noting that Africa is now the flowering of vocations for the Church and for the Congregation. Anthony Njenga is the sixth Orionine Religious of Kenya reaching the sacred orders after Father Peter Wambulwa who has celebrated one month ago ten years of priesthood, Father Raphael Kailemiah, Father Mboche Paul, Father James Waituika F and Father Morris Mawira. To our three new deacons we wish a good diaconal service under the motherly care of the Blessed Virgin. With St Luigi Orione let's say Ave Maria e Avanti! The original text is published on the website of the Congregation (donorione.org). The English translation is of the editors of the blog. The Solemnity of the Blessed Virgin Mary was marked this year in Nairobi of a little more special coloring. The entrance to the the Postulancy of two of our students in philosophy, Peter Karanja we Wilcliff Mumia and the 10 years of priesthood of Father Peter. The tradition here is to celebrate the entrance to the Postulancy every November 20th in commemorating the main patron saint of the Congregation. This year the special note was the tenth anniversary or the priestly ordination of Father Peter Wambulwa Wakoba. First Orionine _ priest of Kenya, Father Peter was ordained on November 19 of the year 2004 in Kitale his hometown. 10 years are passed that he said yes to serve the Lord in the service of the ministerial priesthood. In celebrating this jubilee of tin or aluminum, he wanted to give thanks to God in a special way for the work of love that he has consistently achieved in him and through him. To that we have combined the entrance to the postulancy of our seminarians. Some would read there a simple coincidence, but for us Sons of Divine Providence, we see a work of the providential action of the Blessed Virgin Mary. While the eldest celebrates 10-year on the footsteps of Christ in the service, the cadets decide to make their first decisive step in the religious family of Don Orione and make themselves sons of the Mother of Divine Providence. With them we give thanks to God and for them we pray the Blessed Virgin, Patron of the Congregation to intercede on their behalf. 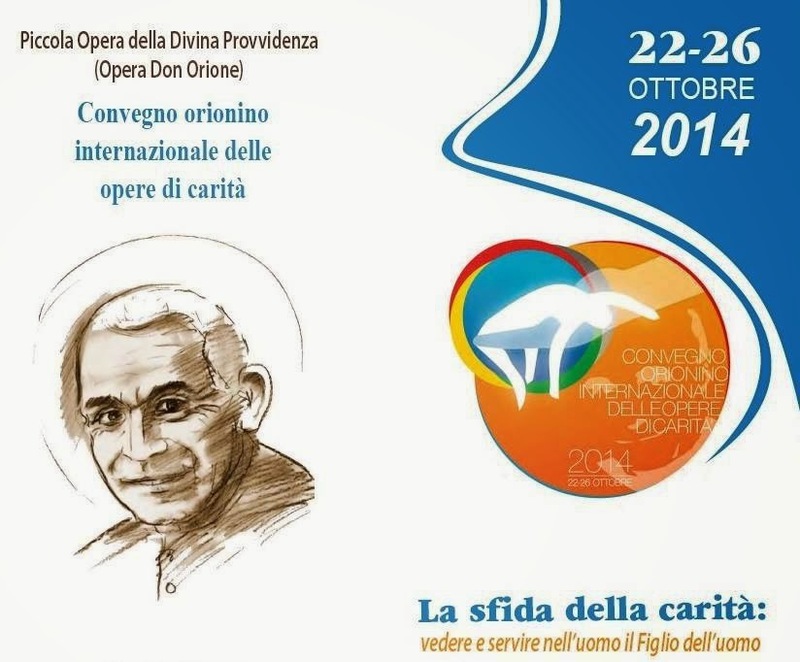 With Don Orione, let's say Ave Maria e avanti! One of the dream of Don Orione, his great love for the Blessed Virgin Mary crosses the borders and wins the hearts of all his sons and daughters. Our Lady of the Safe Keeping has just appeared a. Browsing Oceans and traveling through almost six thousand kilometers, the Statue of Our Lady in the Safe Keeping which surmounts the Basilica of Tortona and protects the city of origin of our Founder Don Orione has been erect in miniature copy in St Peter's Parish a. The work is the initiative of Father James Njoroje, Parish Priest and his Vicar Father Morris Mawira. The idea is to dig deeper into our faithful of Kaburugi parish to a predilection love for the Blessed Virgin. Located at the entrance of the parish, in the main compound, the Statue of Our Lady of the Safe Keeping made of clay and gilded in bronze color, of one meter tall set on a pillar of nearly three meters facing the Parish Church. The Blessed Virgin with Love and Joy welcomes all who pass through the gate of the mission and lead them to her Son. Ad Jesum per Mariam, as underlined Don Orione "To Jesus through Mary". And to mark this mediating power of the Holy Virgin complete, she actually drive visitors from this place to her Holy Son's while open Heart who greets them with the same love. The Blessed Virgin of the Safe Keeping face under a certain angle to the Statue of the Sacred Heart of Jesus located at the close of the presbytery. Thank you to visite Kaburugi. You will always be welcomed by Mary Our Lady of the Safe Keeping and taken to the Heart of Jesus. With Don Orione may we always say "Ave Maria e semper avanti"
There are a couple of weeks was held in Italy at Montebello della Battaglia the International Convention on the Works of Charity and Education. From Kenya attended Father Peter Wambulwa and Mrs. Beatrice Nyambura Head-Teacher of the OCTC (Orione Community Training Centre of Kaburugi). Mrs. Beatrice Nyambura has kindly given us the very rich report of the five days' work. We give you here the text. The meeting was held at Montebello in Italy which was represented by all delegates of the congregation of sons of divine providence and it also included lay people working in Education institutions. November, month of the "Requiescat In Pace"
For us Sons of the Divine Providence, as heritage from our Founder St Luigi Orione, one of the most commonly recited prayers is the Prayer for the dead or for our Faithful departed. It is however, one of the greatest acts of charity we can perform to our brothers and sisters who have left this earthly world for the journey towards the New Jerusalem. Through our prayers, we try to help the faithful departed during their time in Purgatory, so that they can enter more quickly into the fullness of Heaven and from there, in the company of the Angels and the Saints intercede for us. As in a particular manner our Mother Church invite during this month of November to pray more for the souls of her departed sons and daughters, our Community of the formation house in Nairobi has chosen this year to celebrate this prayer at Muthangari, the religious and priest cemetery, near St Austin Catholic Parish. We have been fortunate to have with us Fr Isaac Vondoame from Togo, on his way journeying to the Mozambique where he is appointed for mission. Every day, at evening prayer, after mentioning the name of our brothers, sisters and confreres departed, we use to say for them Requiescat In Pace "Eternal rest grant unto them, O Lord, and let perpetual light shine upon them. May the souls of the faithful departed, through the mercy of God, rest in peace. Amen". Fr Stan: "I'm an Orionine and am trying to become a complete man"
Specialists in Theology and great scholars have agreed to affirm that love is the generative force of creation. Nature itself reveals an additional dimension, that love of creation is the source of life. Love the Creation is above all express one's gratitude to the Creator for Strength, Beauty, Bounty and Providence of which he continues to fill his creation. For us Sons of Divine Providence, that love of creation also involves healthy use of the resources of this creation and especially leveraging the talents that the same Divine Providence has rewarded each one of us. sdp.kenya _ P.o.Box.15145-00509. Nairobi _ providencenrb@yahoo.com . Picture Window theme. Powered by Blogger.